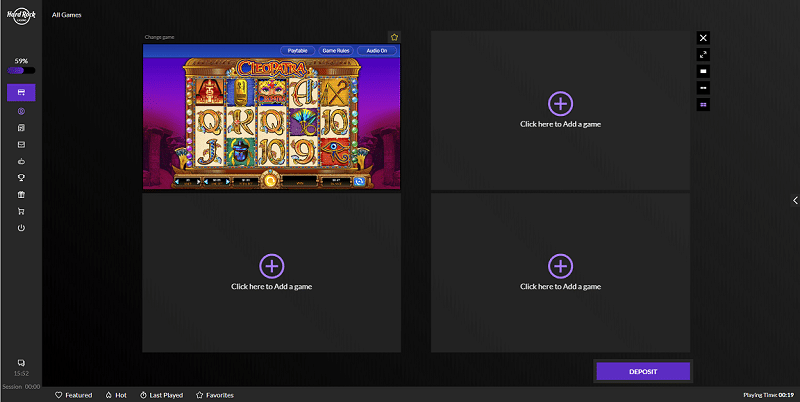 We’ve all heard of multi-tabling online poker tables, but multi-tabling slots? 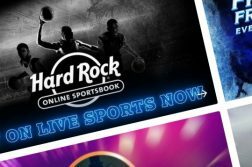 Hard Rock online casino, which begun a soft-launch phase in tandem with the debut of Hard Rock Casino in Atlantic City on June 28, has wasted no time shaking things up, with an innovation that has yet to be seen in the New Jersey iGaming market. Traditionally, slot players, whether online or at brick & mortar casinos, enjoy one slot at a time. There are exceptions of course, such as land-based slots that enable players to spin multiple sets of reels with one push of a button. But until now, the ability to play more than one slot at once in an online setting (at least in New Jersey) was severely limited. That is no longer the case. As part of its partnership with Hard Rock online, platform provider and newcomer to the NJ iGaming market Gaming Innovation Group has implemented a nuance that allows players to play four games at once. How it works is fairly simple, although not entirely obvious. When players fire up a slot, or any game for that matter, a sidebar will also load, presenting an option to split the screen into two or four boxes. The icons are tiny, but a close glance reveals their intent. From there, players can click on any empty box to be whisked away to the game lobby, where they can select another game to play. Once they’re all set, it’ll be up to the player whether they want to spin each slot manually, or go for the ultimate in convenience and set the slots to autoplay. There’s even little preventing them from playing a game of video poker or blackjack in one box while slots run on autoplay from the others. The mixing and matching possibilities are virtually endless. There are a few limitations. Namely, the multi-game feature does not appear to be enabled on smartphones and tablet devices. The lack of this feature on smartphones makes perfect sense, as even the largest of screens is far too small to support multiple games. That is, unless players enjoy accompanying their slot play with a severe case of eyestrain. Tablets are a different story, and we do hope that Gaming Innovation Group implements the ability to play at least two games at once. Also, and this is not apparent at first, trying to play multiple instances of the same game will result in a malfunction — sorry, Divine Fortune lovers. 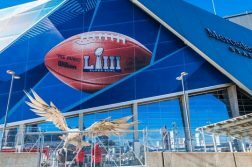 Qualms aside, the multi-game experience was surprisingly fluid, with four games running more smoothly than a single slot on many other NJ online casino sites. There were a few minor hiccups, but those could easily be attributed to Hard Rock still being in a soft-launch period. 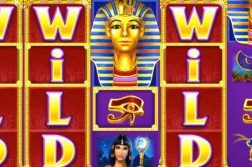 It’s a bit early to tell how well the multi-game feature will resonate with slot players, many of whom are casual players looking to stretch their gambling dollars as far as possible. The absence of mobile play, which constitutes a pretty hefty segment of online gambling prevalence in New Jersey, also severely limits the feature’s appeal. What’s left is the bonus hunting and action junkie crowd that preferences playing on their home computer. We imagine this is a fairly small segment, but one that generates a proportionally large amount of revenue for operators. It’s to them that multi-gaming will appeal. Whether it be slots, blackjack, or video poker, all games found on NJ online casinos favor the house. Granted, the house edge is generally smaller online compared to similar games found at land-based casinos in Atlantic City, but still averages a percent or two for most video poker games, roughly the same for blackjack, and between 3 – 6% for slots and other table games. The point here is that players who previously played one game, and now play four, are at risk of losing their bankrolls four times as quickly. So our advice to players thinking about trying out this feature is to lower their normal denomination. That way, they’ll still enjoy all the benefits of multi-game play, including far more bonuses and big wins, but will have a better chance of staying liquid for longer.